An Oasis of Trust and Satisfaction. 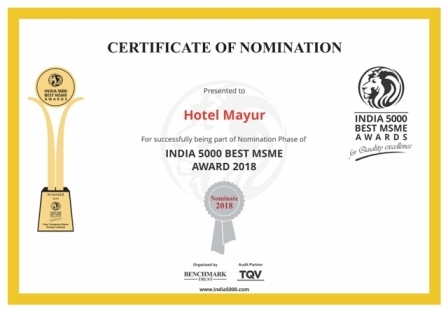 Located in the heart of the city, Hotel Mayur, Gwalior, is one of the most recommended hotels in the city. The hotel has always maintained a trust and satisfactory relationship with guests who visit the hotel. We are located behind the railway station and from the hotel all guests have easy access to public transport and convenience of stay. We promise you the best hospitality and service during your stay. We invite you to be our honoured guest and experience a stay in Gwalior like never before. Hotel Mayur provides you with beautiful rooms equipped with all facilities needed for a happy stay in Gwalior. The hotel has a wide variety of rooms including a/c and non a/c rooms. Book a room from the hotel's official website andbe assured the best prices for your stay. All facilities are available on request.